John Ternus, Apple's VP of hardware engineering, came onstage during the iPad Pro 2018 unveiling event and claimed that they "are faster than 92% of all the portable PCs sold in the last 12 months, including the most popular Core i7 models from the top manufacturers." We have the new octa-core A12X Bionic processor to thank for that, but there is more. Apparently, "the iPad Pro delivers Xbox One S-class graphics performance in a product that's 94% smaller," according to Ternus, "and there's no AC cord required." This feat goes to the new hepta-core graphics chip, against the quad-core GPU in the A12 Bionic that powers the 2018 iPhones. We've grown accustomed to Apple using a souped-up version of its iPhone chipsets for the iPad family. 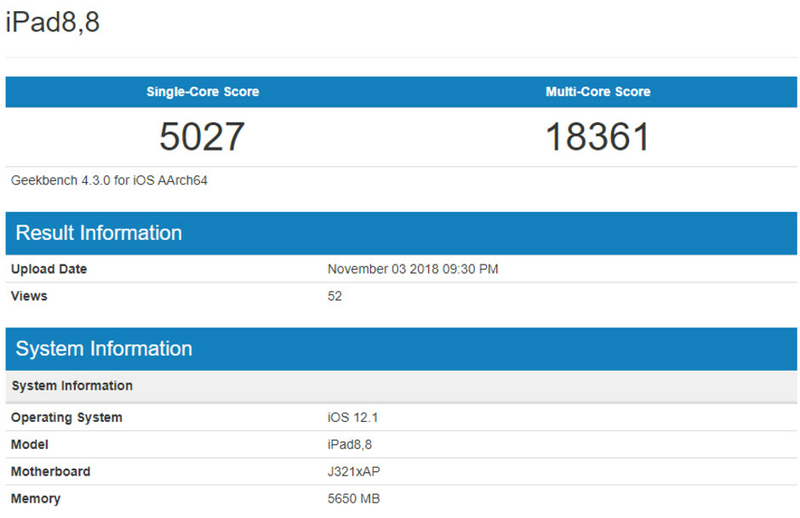 What we didn't know, however, is exactly how much faster would the new A12X Bionic chipset that is in the iPad Pro 2018 family be. Well, the Geekbench database is getting populated with scores from the newest iPads, and the highest-end model with 6GB RAM decimates everything out there - your old laptop included. The iPad model number with 6GB RAM scored more than 18,000 points on the multi-core test, and more than 5,000 on the single-core pass. For comparison, the new iPad Pro can score as much as a 7th-gen Intel Core i7 processor in a quad-core configuration at 4.2GHz, while running at a much lower frequency. For another comparison, the newest iPhones score a tad over 11,000 on the multi-core test and are still beating everything Android and iOS had to offer so far. Long story short, Apple wasn't playing when it claimed that the new iPads are faster than most consumer laptops, and that unreleased Assassin's Creed game onstage demo that was running at the whopping 120fps now seems pretty credible. Thing is if these A-series SoCs were that good, Apple would've put them in a MacBook already. More than likely this type of performance doesn't carry over on anything but iOS, which would put into question the usefulness of this benchmark. It's just fast on this particular benchmark only, try run Cinebench and Time Spy Extreme (or any 3Dmark test), lets see if it's comparable to other $999 laptop. Exactly. Benchmarks like this are stupid metrics. Further, an overall number tells you nothing. It would be incredible at a particular task, but terrible at another. Also Apple make these claims every time they come out with their new chip - better than all your laptops, console-like graphics! Always turns out to be false in reality. Still the best tablet you can buy, though. The A13X (if called this) may trounce the i7 and get into i9 status. If everything holds true next year, we could be seeing 6700 single core / 34,000 multicore speeds next year. This is based on a 35% increase over single core and 90% multicore for next year. If true this leaves Android back 5 years. No real benefit of power . As long as you dont have any use of it in ipad apps . I hope Apple use this super powerful chipset in their laptops. It will bring better battery life and full professional apps to use the amazing power . Only for the entry level Macbooks though. The 2018 Pro models have superior Core i7 chips, in many tasks that Geekbench doesn't show. 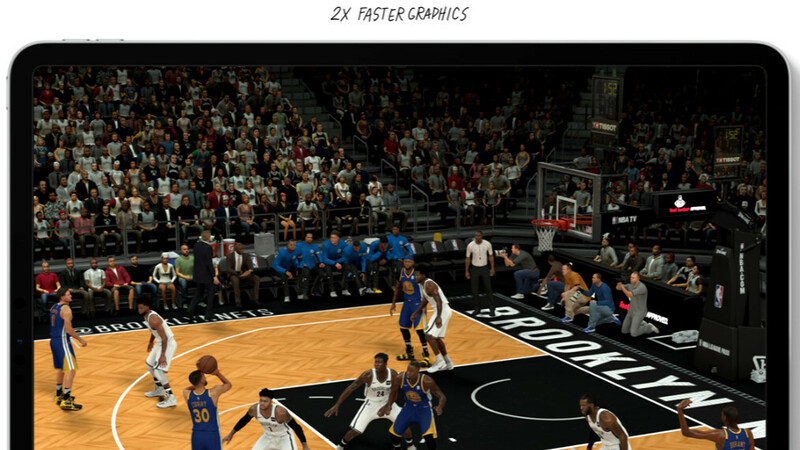 And the new iPads are also starting to run PC versions of professional apps (Photoshop CC) and console-quality games (NBA Live) on it's hardware. So the A12X is not THAT useless. It's quite future-resistant too. They're not running PC versions at all, they're running a fully loaded customised Photoshop version optimized for iOS on the iPad Pros. Just because it carries the same functionality, doesn't make it a PC version, it's still an iOS app just more complete compared to earlier versions. Just asking......why are you guys so late on delivering news?? No hate comments please. And aren't 7 cores called 'hepta', rather than 'septa' as you mentioned?? You forgot to mention that parts of GeekBench test aren't the same for Windows and MacOS (laptop/desktop CPUs) and for Android and iOS (mobile CPUs). Which makes this whole article pointless. Geekbench's founder says results are comparable across platforms. Just like I said to techie a week back......I will take his word's over yours and techie's. And for the record, the A12X isn't more powerful than the i7-8559U in the 2018 Macbooks. If we speak about GeekBench, we should notice that when the Geekbench 3 was replaced by Geekbench 4, all the Android SoCs received much lower scores while the Apple SoCs received the same! Geekbench 3: Snapdragon 820: ~2350/~5400, Exynos 8890: ~2100/~6450, Apple A9: ~2500/~4500 Geekbench 4: Snapdragon 820: ~1700/~4000, Exynos 8890: ~1800/~5100, Apple A9: ~2500/~4400 Pretty interesting isn't it?! And this scoring system is valid novadays. But despite this I really like Apple products! Go do a read up on the subject. GB 4 is a alot better benchmark than GB 3 was. Just take your GB3 scores to try and equal the A-series then? Lol, so if I make a benchmark test tomorrow and say it's comparable across all the platforms then you'll believe me? So should I throw away my new 8th gen 6 core i7 laptop that has almost the same GeekBench score as the new iPad Pro, and start rendering the Premiere videos on the iPad to do it faster? Yeah great, let's all drink some iPad Kool Aid! According to GeekBench, MacBook Pro 13 2018 has a score of 4507 and 16480. https://browser.geekbench.com/macs/432 MacBook Pro 15 2018 has a score of 5053 and 21357. https://browser.geekbench.com/macs/430 iPad Pro has a score of 5027 and 18361, as written in this article. If GeekBench results are "comparable across platforms according to the GeekBench founder" then iPad Pro is clearly faster than the newest quad core MacBook Pro 13 and just a little slower than the 6 core MacBook Pro 15! Oh, wait... No, it actually isn't as nearly as fast! Which means the GeekBench results are NOT comparable across platforms. With Geekbench 3, this was the case and it favoured Arm-based chips more. In version 4 the situation is much better, but the tests are pretty generic. You can only do tests that don't rely on specific ARM or X86 instruction sets. So while not a 100% indication of real-life performance, it's a pretty good one to see which one is the fastest on paper. That's good news for everyone. I am sure Intel has at least couple of ground breaking technologies hiding in the closet. The 5-10% increase with every new gen was so lame. I think the 8th gen finally improved on that. The 8th Gen mostly had higher clock speeds, extra cores, and few architectural improvements. The latter alone wasn't the reason for the higher single-core scores when comparing similar models. such a good clickbait, are the ipad sales slow and they needed a boost. you can't compare x86 architecture with arm one, it is nonsense and idiotic. For how long can Assassin's Creed be played on this device, before it starts to heat up and throttling kicks in? I have butthurt cream with special discount just for android trolls, guys, do you want some? Just a marketing scheme, what good is all this power with closed eco-system in a non-versatile app environment?